Keeping Up With the Kapenga's: The Weekend FUN Continues! As if Friday wasn't enough entertainment we decided to keep it going...all weekend long. We put wedding planning and projects on the back burner for the weekend which was so nice. I'm so luck to have someone like Dave who sees the importance of and values family time even if it means being completely unproductive! Saturday afternoon we went to his sisters house to swim for a bit and later while Jenna took a nap we washed and cleaned his boat. 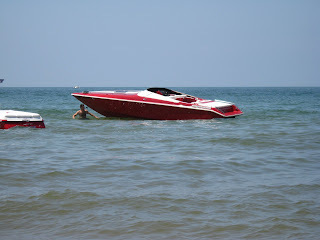 Then the three of us headed to Grand Haven for a bite to eat and walked around to watch the boats. Jenna of course needed some ice cream! Sunday we went to the early service at church and then packed up the boat and headed to the lake for the afternoon. We were really nervous about how Jenna would do.....this is not a family boat! Dave's boat is extremely loud and is meant to go fast. 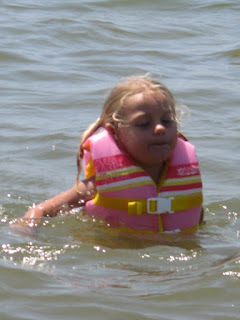 We got it in the water and Jenna was all smiles. She was even telling him to go faster! We took it through the channel and down to Laketown Beach where we anchored, ate some lunch on the boat and carried our stuff to the beach. We had a ball playing in the sun, swimming in the water (chilly but bearable) and catching some rays. Later in the afternoon we packed back up and headed back to the boat. Jenna was definitely tired by this point....three days of almost non-stop fun with only a short nap on Saturday was catching up with her. 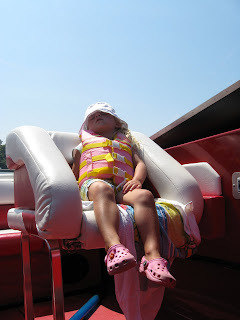 We got back to the Holland channel and within minutes of going slow her little head fell forward and she was sound asleep, she must find the loud exhaust of the boat soothing? When we got in back on the trailer she even stayed sleeping as we took off her life jacket and got her out of the boat and into the truck - that's tired! We were all VERY tired Sunday night and crashed pretty early. Monday was back to reality but it all seems a little better after a nice fun weekend. I think the sand was a little hot!